Ecological processes govern seasonal changes in microbial communities living along rivers in the hyporheic zone, where groundwater and surface water mix. These processes have been well-studied in plant and animal communities. But the extent to which they govern riverine microorganisms that regulate ecosystem carbon and nutrient availability is unknown. New technology, along with advances in statistical modeling approaches developed at the Pacific Northwest National Laboratory (PNNL), now allow for the investigation of these dynamics across space and time in microbial communities. The hyporheic zone is a critical ecological feature. It harbors a rich diversity of microorganisms that regulate carbon and nutrient availability for other organisms along the river. For example, hyporheic microorganisms can remove excess nutrients from agricultural and sewage run-off. They can also release carbon dioxide into the atmosphere by processing organic matter from inland and upriver plant debris. Scientists studying the hyporheic zone typically just analyze the complex conditions in either groundwater or river water. Focusing instead on where the two types of water mix is incredibly challenging. But it is critical for understanding the planet's response to environmental change. 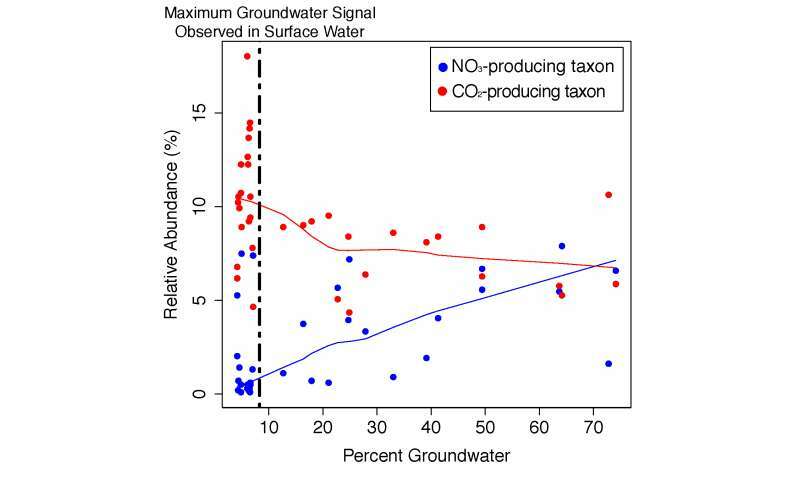 Results in the current paper suggest that selection for microorganisms that transform organic matter into carbon dioxide is particularly strong during the spring and summer months. As the seasons progress, changes occur: river water levels fall; groundwater seeps into the hyporheic zone; selection for carbon metabolizing organisms declines; and organisms that cycle nitrate rise in abundance (Figure). These changes provide a conceptual basis for ecosystem functioning as it relates to changes in the composition of microbial communities living in sediment. Researchers used the Columbia River hyporheic zone as a model system for coupling changes in selection, which acts on organisms. Over time, resulting changes in ecosystem health are observable at a large scale. This conceptual model, researchers hypothesize, applies to a wide range of environments and ecological systems. The results will help researchers understand the mechanisms that drive increases and decreases in organisms that produce pollutants and greenhouse gases. Bacteria, fungi, algae, and other microorganisms in and around rivers worldwide convert massive amounts of organic carbon into carbon dioxide. Yet scientists understand little about how organisms change through space and over time or what processes drive these changes. Global temperatures continue to rise. Changes in land use continue to alter nutrient inputs into river systems. So knowing more about hyporheic carbon and nutrient cycling is increasingly important for protecting ecosystems and human, health. The current study's PNNL researchers aim for two outcomes: a mechanistic basis for describing the current state of such riverine ecosystems. And a means of predicting how they will change in response to future environmental scenarios. From their river field site, researchers gathered sophisticated measurements every three weeks to describe microorganisms and chemistry in the Columbia River and its hyporheic zone. They also used newly developed statistical modeling approaches pioneered at PNNL to infer ecological processes through space and time. The team conducted its study from March to November 2014. Their field site was in central Washington, where the Columbia, one of the nation's largest rivers, flows near the Hanford site, a former nuclear materials processing facility. We are working to incorporate mechanistic information on microbial communities into Earth Systems Models. This will help better predict rates of carbon and nitrogen cycling in future climates.